Description Enjoy the fragrance of ancient Egypt and discover the daily life of the ordinary people by cruising the Nile visiting the monuments of Luxor, Edfu, Kom Ombo and Aswan. Description Discover the life of the Bedouins and their traditions and make an adventure trip in the desert and ride a camel. After the sun set, enjoy your BBQ dinner and then get back to your hotel. Description While being in Hurghada, take the chance and visit the highlights of Luxor. You'll visit the "Valley of the Kings", the funerary temple of "Hatshepsut" and the temples of "Karnak". 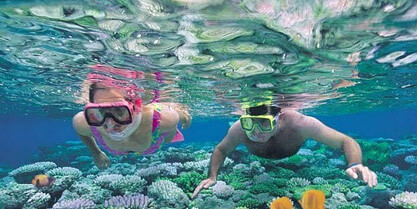 Enjoy relaxing on the sandy beach of "Sharm el Naga" and its house-reef. The corals there are untouched and the variation of coloured fishes is hard to find somewhere else. Enjoy sailing the Red Sea and get the best opportunity to relax and to watch the coral reefs with its fascinating colours and the endless variation of coloured fish.